The effects of Astaxanthin on skin have been studied for close to twenty years. In 1995 it was discovered that Astaxanthin was effective in preventing photo-ageing of mice skin. In another study conducted in 1998, using rats this time, it was found that astaxanthin was one hundred times more effective than beta-carotene and one thousand times stronger than lutein, in UVA light promoted oxidative stress prevention. Later, a 2002 study published in The Journal of Dermatological Science stated that astaxanthin protected against changes in human DNA which had been provoked by UVA light exposure. What is more amazing is the fact that this naturally and pure, antioxidant may not even have to be ingested to attain all the benefits of skin protection. In a 2001 study carried out on hairless mice to investigate if astaxanthin provided topical advantages. The mice were irradiated with UVB radiation for eighteen weeks to mimic photo-age skin. The mice that had astaxanthin applications showed fewer wrinkles compared to the control group, in addition to younger-looking collagen. Actually, the collagen of the mice treated with it looked like it had never even undergone radiation exposure. The researchers also found that it was effective as a skin lightening agent, something that is in high demand in Asia. They discovered that an application of astaxanthin applied to the skin reduced melanin (the pigment responsible for darker colored skin in humans) by 40%. This also helped to cut down on age spots and freckles. Haematococcuspluvialis, the marine algae with highest concentrations of astaxanthin produce the compound to protect themselves from ultraviolet radiation. Since the pigment is such an effective absorber of solar radiation, it was initially proposed to be used as a topical sunscreen. However more recent studies indicate that it can revitalize skin from the inside. 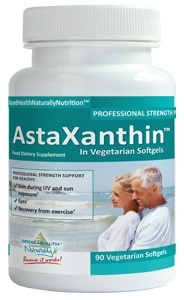 Astaxanthin has been found to be one of the most powerful marine plant antioxidants. It collects in the skin and penetrates into every layer, as opposed to topical sunscreens which only make it to the superficial layers. This way it can provide vital protection against ultraviolet radiation, the greatest skin cancer factor. Ultraviolet light exposed skin cells give rise to bursts of free radicals that activate effects of ageing like wrinkles, drooping skin and increase the risks of skin cancer. In skin-cell cultures in laboratories, when applied, all these effects are prevented indicating this superior carotenoid can avert skin ageing due to ultraviolet radiation. In studies with humans it was found that just 6 milligrams a day, consumed for six to eight weeks can cut down on crow’s feet wrinkles, reduced age spots, while elevating moisture content and elasticity in the skin. You can buy astaxanthin by itself, and you will get all the benefits. But you may be interested to know that krill oil naturally contains it, and is uniquely powerful. Krill oil is one of the best sources for the carotenoid, and importantly, also contains the most superior source of omega-3 fatty acids found naturally, anywhere. Either way, there are no harmful side effects to astaxanthin. There was a time when fish oil was considered the best omega-3 source. However, the problem with omega-3's (from fish oil) is that they oxidize quickly when exposed to air, thereby destroying the fats permanently. In order to protect them, drug manufacturing companies add pharmaceutical astaxanthin to preserve the omega-3 fats from oxidation. 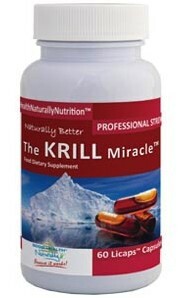 This makes krill oil hundreds of times more resistant to damage from oxidation, thus making it a better choice.